Over the last year I have seen many accessories allowing you to do rotisserie style cooking on a Big Green Egg. Up until now I have not had the pleasure of cooking with one. I am happy to tell you that all changed this past Father’s Day! My wife and kids got me the Kamado Joe: Joetisserie for my large Big Green Egg. Last night was my first opportunity to use this new toy and I wanted to share my experience with you all. It was not the best looking chicken I have cooked but it tasted great. Now sit back, grab a cold Ballast Point Pineapple Sculpin IPA, and enjoy this post for Joetisserie Chicken. Last night my daughter was coming over for dinner and I decided to make a whole marinated chicken for my first cook on the Joetisserie. For the marinade I used cilantro, garlic, cumin, chili pepper, lime juice, jalapeno, salt, and pepper. I put the chicken in the marinade the previous night so it was good and ready for the cook I had planned last night. Putting the chicken on the spit rod and forks was very easy. I trussed the chicken to keep the wings and legs in place while the cook was happening. I preheated the BGE to 350° measured at the dome. 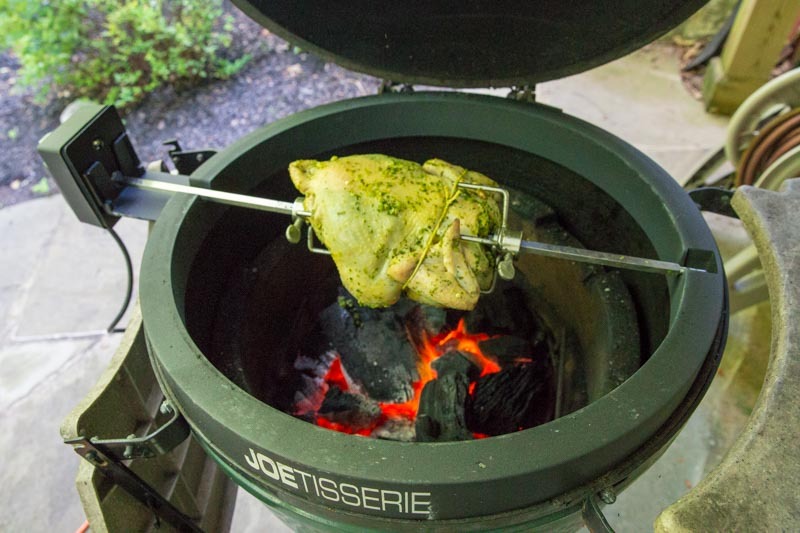 Once the temp was set I placed the spit rod (with chicken) on to the Joetisserie and turned it on. The great thing about this design is the cast aluminum ring is slanted towards the back allowing you to close the lid on your large Big Green Egg while the food is cooking. The motor is easy to put in to place, start (and stop), and most importantly is quiet. I cooked the chicken for 1 hour and 20 minutes or until the instant read thermometer read 160°. As you can see the chicken skin got blistered and dark. I suspect I had the firebox loaded with too much lump and there was not enough separation between the heat source and the chicken. I will take that in to account for my next cook. Overall I am very pleased with the Joetisserie for my Big green Egg and cannot wait to cook with it again!